While he enjoys the professional roles he fills after hours, after 25 years of practice Dr. Mark de Wolde still loves working with animals most. Photo by Adam Bramburger. Dr. Mark de Wolde is a busy man and his commitment is causing veterinary colleagues across Ontario to take notice. Last month, the president of the Upper Canada Veterinary Group, which owns and operates four clinics in the area including the Lennox and Addington Animal Hospital in Napanee and a spay-and-neuter clinic in Bath received the Ontario Veterinary Medicine Association’s 2018 Award of Merit. It’s a high honour for his work professionally and within the community. “It’s kind of nice for a small-town veterinarian to be honoured by his peers in all of Ontario,” de Wolde said. For de Wolde, his service goes far beyond just running clinics and treating patients. He works with licensing body, the College of Veterinarians of Ontario, both its investigations branch and in a mentorship program for new and experienced vets. “It’s nice to be involved in both of those aspects. It helps me as an individual veterinarian to do a better job of what I do,” he said. 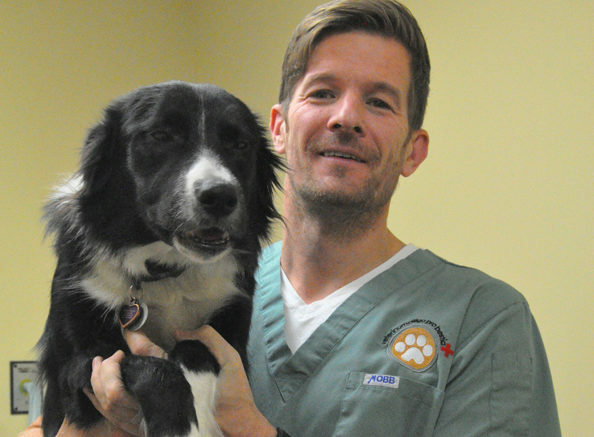 De Wolde is part of a management group that sets standards for animal hospital operation and he also serves as president of the Kingston area co-operative emergency pet hospitals and of a pharmaceutical firm above and beyond his regular duties. According to de Wolde, his work ethic and drive, and even his profession itself took root in his rural upbringing. Born in Kingston and spending much of his youth north of Oshawa, de Wolde settled in Napanee in 1993 after graduating from the Ontario Veterinary College in Guelph. The first practice he owned was in Bath. While he offered some veterinary medicine in agricultural settings as one might expect given his upbringing, he discovered a real love for working with companion animals. In de Wolde’s eyes, that can be more challenging because it brings in an emotional element, compared to working in the farm community where people may be more inclined to focus on monetary decisions. That emotional compass might have helped lead de Wolde and a business partner to open the Kingston Napanee Spay Neuter Clinic in Bath a decade ago. Originally, de Wolde said, they felt they were spending a fair amount of time doing work with humane societies, kitten rescues, and other charitable groups and they felt that was becoming a bit intrusive to their regular clients. A decision was made to designate one facility as a dedicated clinic to help those groups and run it as a non-profit service. Eventually, working that clinic and doing more research, de Wilde said they discovered that 86 per cent of people who would seek out a spay/neuter facility did not have a regular veterinarian. While grappling with the idea a low-cost facility may take money from their own business operation or other veterinarians, they eventually opened the clinic to the public and found a huge demand for service. While that is encouraging de Wolde says, culturally, society has to do a better job in educating people they don’t need to breed animals when there’s already enough of their species to go around. “We need to make sure people take responsibility for their pets and make sure we don’t create more of them when that particular supply far outnumbers the demand. Another charitable initiative de Wolde has been involved with involves housing. He was informed about homeless people who had become sheltered in downtown Kingston who also had pets they couldn’t part with. When they applied to get housing, he recalled, they struggled to get subsidies because their pets weren’t spayed or neutered and their vaccinations weren’t up to date. His clinic teamed with a local limousine company to offer the people free transportation and veterinary care. “For you and me, it may seem so menial, but for them, the $80-100 bill may be out of reach. It can get to the point where they won’t find homes,” he said, adding dozens of studies show the benefits of animal companionship for people of all ages. While de Wolde said he clearly doesn’t need awards for motivation, he said the recognition offers reassurance. “For me, as an individual veterinarian, No. 1, it helps to solidify that obviously I’m approaching my patients and my clients in an appropriate way. Despite having graduated 25 years ago, I’m still doing it in the best interests of my patients,” he said.